This prompt – Cherished Object – provoked much reflection. Taken separately, ‘cherished’ and ‘object’ are easy to identify. I cherish my family, my health, my country. I possess objects that bring me pleasure, assistance, meaning. But what would I grab if I was running from my burning house? Do I cherish any object that much? Earlier in life, I could have easily selected specific objects I cherish because the tangible objects themselves mattered. Memories were slowly being created, and my future seemed endless. Now it’s as if the decades, your gifts, my acquisitions, and all my experiences have merged. When I look around my house at art on walls, treasures on shelves, my dog-eared books, my smudged CDs – no matter the object, I am unable to isolate one to write about. What I realize is all those objects – cumulatively – reflect what I truly cherish. Can “Nature” be an object? I’ve loved nature since I first broke apart an earthworm for a writing utensil; picked up a stone from our driveway for Hop Scotch; watched Dad reveal the puzzle of Snake Grass. My most Cherished Objects are talisman rocks, pocketed pieces of wood, dried flowers and pressed plants I’ve collected throughout six decades of life. 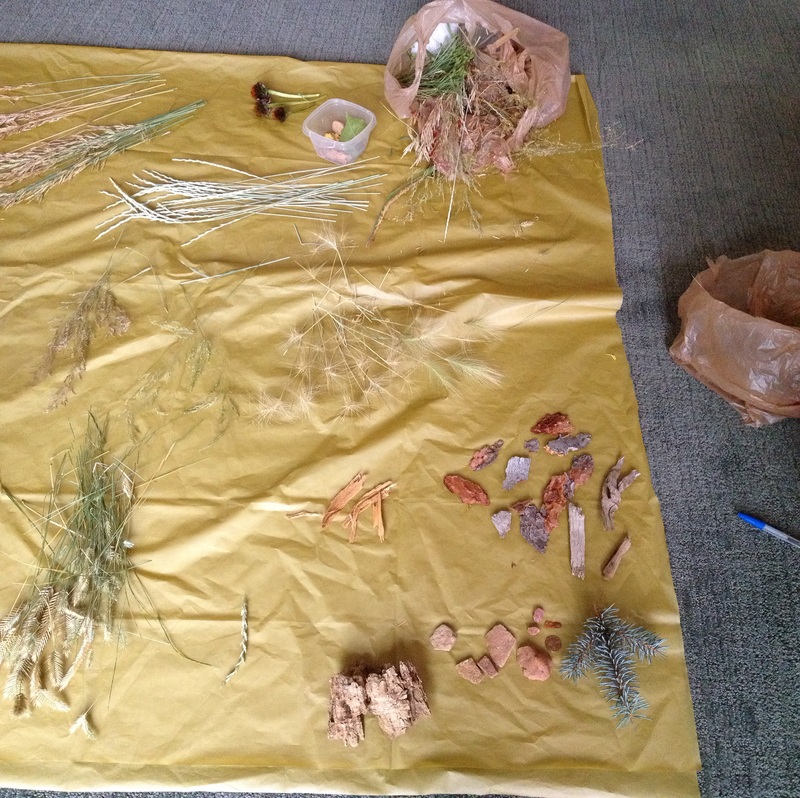 I’ve used nature in so many hobbies – gardening, landscaping, papermaking, the study of herbs, building garden art, hiking, biking, mapping, rearranging stone cairns (zen) in my living room. I’m never happier than when I am ‘gathering’ somewhere on a trail while brilliant sunshine blesses my endeavor. Don’t worry; I practice ‘take least; leave no’ and am careful not to spread seeds where I shouldn’t. As with previous hobbies, whatever new ones I take up eventually incorporate my nature goodies (can I play the keyboard using stones for fingers?). 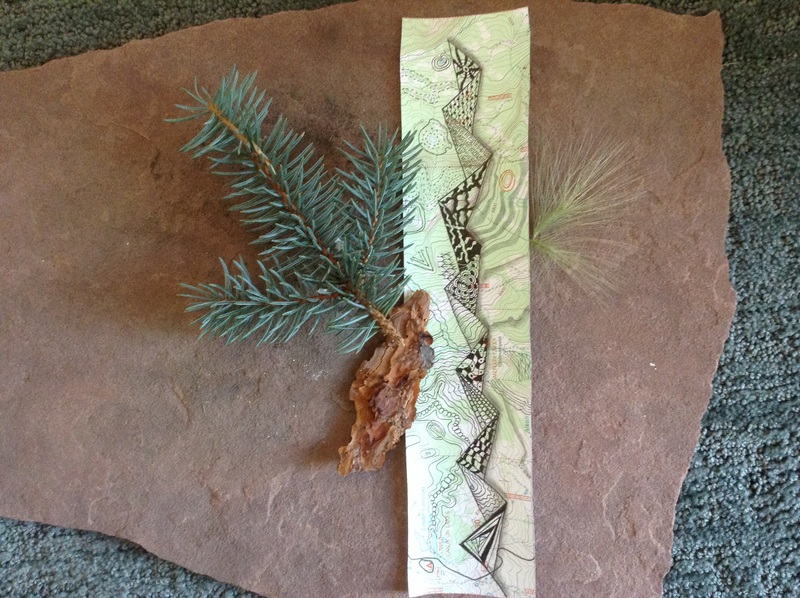 Two of my newest hobbies – Mapping and Tangling – have not only wound their way to each other, but they’ve linked themselves to Nature. Topographic maps are a ‘tangle’ themselves, already filled with iconic patterned symbols. A couple years ago, I acquired seven large topo maps from the local branch of the Federal Bureau of Land Management intending to use them in an art project. They sat in the closet until I started tangling. They moved out of the closet, but still sat patiently until last weekend after I spent 10 days outdoors, coming home with a few new nature treasures (and a few skin irritations from my light foraging). All Cherished in fewer than 500 words (unless you count photo text!). Well said, Sammy. Nature is full of inspiration and a calming balm for the soul. 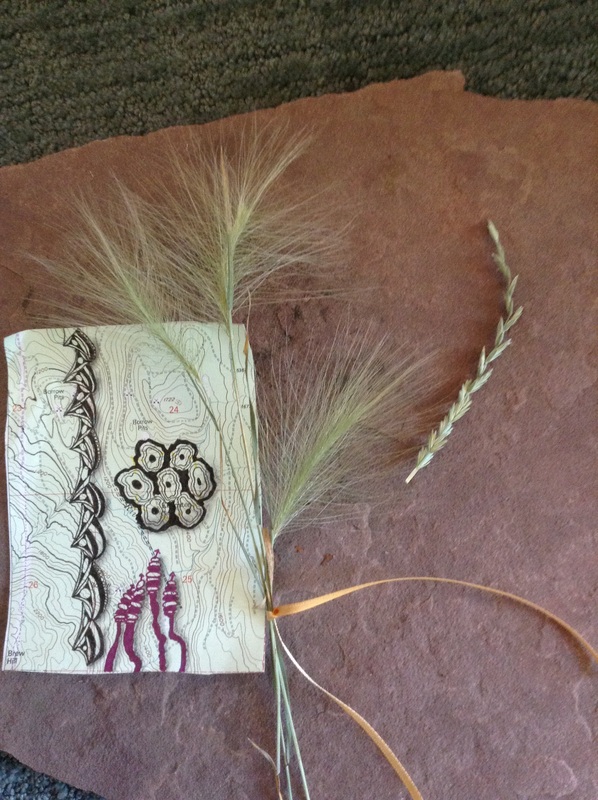 It is not a surprise that it has found its way into your tangling, but the results are beautiful. Thank you, Joanne. It is a calming balm, with occasional rages of wind, storm and fury 😊 In winter I might have selected an indoor object, but in summer I cannot turn my eyes from what grows and beckons in the warm embrace outdoors. I love how you beat the rules Sammy. Nature is (or at least should be) a much-cherished object. I have always like hiking, walking and viewing in natural settings, but I think I’ve come to appreciate them more as I’ve gotten older. By the way, you’re the first blogfest post that I am reading! Good job. Thank you so much for participating and for helping to spread the word. You rock (sorry, pun intended). Aww I’m honored you read me first and chagrined to realize my last posting task – adding the blogfest badge – got waylaid in my late night editing. I laughed at your pun 😀. Excited to read what others share throughout the weekend. I ❤ your NaZenMaps! You are such a talented lady. You need to frame these in one of those box type frames. I'm sure you could sell them. As Jo said, the results are beautiful. Thank you, Jude. It seems I’m a “putzer” at heart and playing with arrangements like this are one of life’s simple pleasures. Wow. I fell in love with your topographic maps. They are absolutely wonderful!!!!! What an interesting way to tackle the “cherished” theme as well. I’m about to get started on mine! Thank you, Carrie ! I always appreciate your encouragement. Nice to see you on this blogfest list, Sammy. 🙂 You have many talents and what a lovely post this is! Nature offers so much inspiration. Hi Debbie! I was happy to see your blog on the list too. It will be great reading throughout the weekend for all of us. Thanks for stopping by. My most Cherished Objects are talisman rocks, pocketed pieces of wood, dried flowers and pressed plants I’ve collected throughout six decades of life. I like the way you refer to these objects as talismans. They do bring magic into our lives. Thanks, Greg. There is no question these natural elements have a calming effect on me. SAmmy, I love the way you reference nature as your cherished object. Your posts truly show both an appreciation and a reverence for the outdoors. (and wonderfully detailed, as usual 🙂 NaZenMaps = excellent idea! Hope all is well. Thank you so much, Elsie. I truly appreciate your encouragement. I hope you have a restful weekend! Enjoyed taking a look at this. Never visited before, glad I did. I had the same problem: how to pick one single thing out of a housefull of memories. I “cheated” a bit. 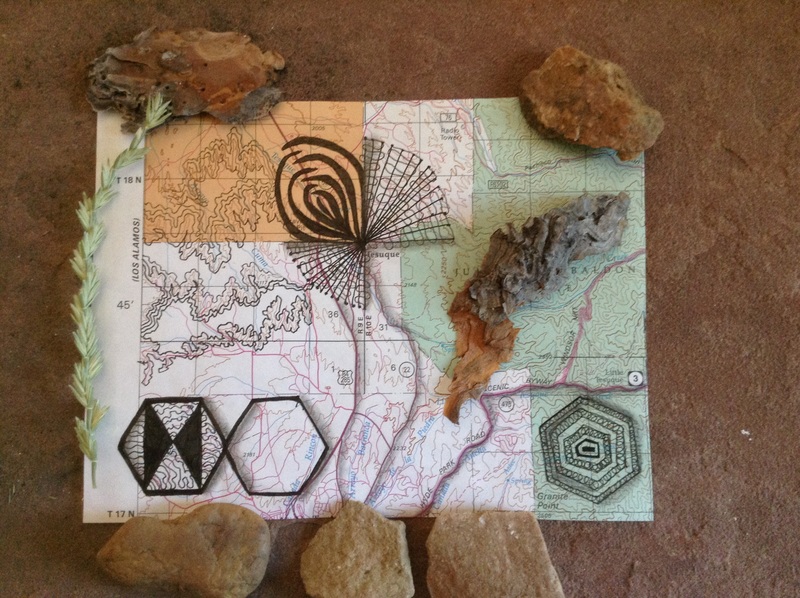 Love the artwork you created out of nature and topographical maps. Oh good! I figured I wasn’t alone in my dilemma. I look forward to seeing how you creatively stretched the rules! As an unabashed tree-hugger, I will always answer the call of the mountains (north woods, red rocks, desert canyons…), even if it means getting knobbies on my Rascal. 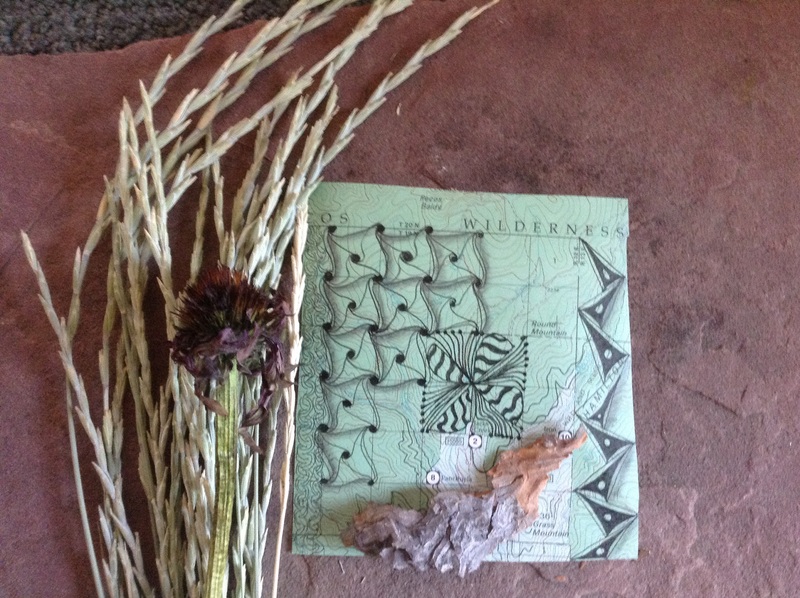 Nature is my muse…great post! Have a great weekend, you tree-huggin’ Curt! Despite your squirreliness in getting around the object choice, I DO understand. I love the map-tangling you are doing — that’s art my friend — and lovely! My brother once told me that he could see i was my mother’s daughter by the proliferation of found objects on every surface — now I confine them to the front of the book cases, and have every manner of shell and seed and feather, all found. BTW, waiting for Dan antion to post his Cherished too! Off to read some others! Thanks, dear. Despite my squirrleyness I have no stuffed animals 😊 but plenty of ‘sculptured’ ones. I think spirituality would be hard to separate from nature as you show with your shelf treasures. Nature not jus calms you down it also provides you with an inspiration that can help you keep going especially when you are down and tired of the worldly problems. Great post. Thank you for participating in the blogfest. Thank you for hosting and commenting! I look forward to seeing your post, too. Nature is wrath and serenity all in one: we learn to accept and adapt to its moods. 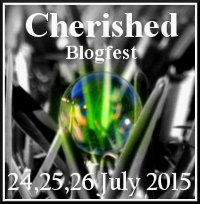 That was so creative and authentic, I no longer want to write a post for Cherished Blogfest! lol Seriously, awesome stuff, incredibly original. Great post! Awww you are so sweet, Joey. I take your praise into my heart knowing you say it honestly. It means a lot. Now go do your thing you awesome Object Cherisher!! What a fantastic way to combine the beauty of nature with your art! I loved the way you used the tops maps. Great post, Sammy! What a beautiful post! You’re really a talented artist, Sammy. 💖 aww thank you, Lainey. High praise from one of my favorite artists!! Besotted is such a messily delicious sounding word! 🙂 lol, it’s one of my favourite words, only used on special occassions! 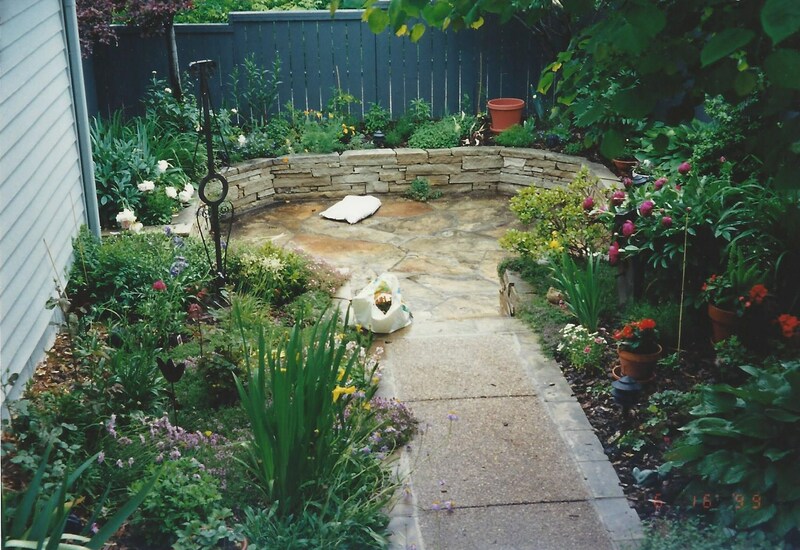 I envy your boulder garden. What a nice place to sit with a morning cup of coffee. Nature is definitely an object of affection by many, something to be cherished and appreciated. Nice work on your post, it’s lovely. Thank you so much for your kind words. 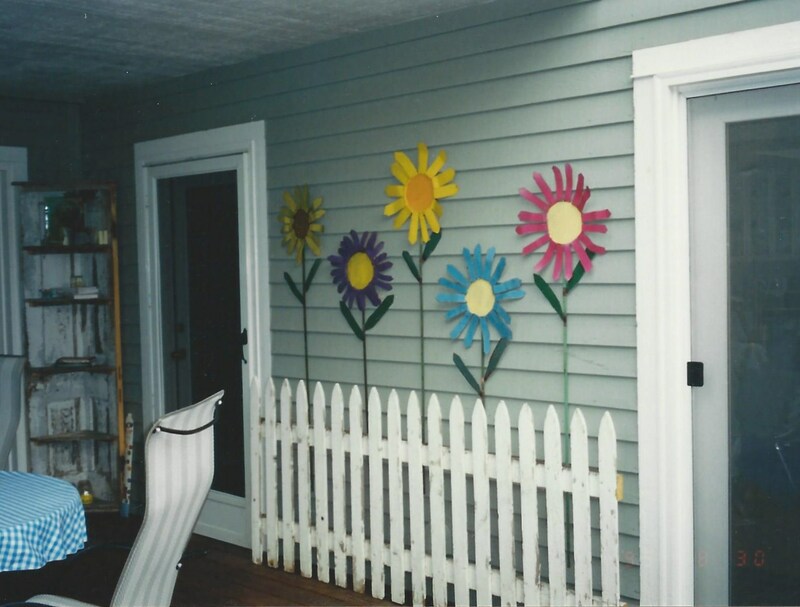 I loved my Boulder house and garden. We have moved several times since living there but it remains a favorite. Beautiful post, I love the way you love to create things using simple items. Thank you so much for your kind thoughts! Sammy, thanks for participating, and for visiting so many! You’re so good with visiting and commenting, I’m hoping to rope you in to host the next blogfest. And yes, nature can be a cherished object– it often isn’t, and always should be. Lovely photos. Good job on being able to stay away from the ‘too personal’. I failed at that, for the first time in almost eight years on my blog! Thanks for your kind words, Damyanti. We meet such special people in this community. I wonder if your decision to choose this theme was a subconscious nudge to share your personal story. It is very hard to carry our deepest sorrows or guilts without ever sharing them. I think you must have felt safe enough to do so, and I hope you are able to return to your ‘regular programming’ without regrets. To host a blogfest, the last thing you need is techie knowhow– which someone can teach you in five minutes if you let them. What is needed is a large heart, and you have a heart larger than a lot of people I know online, and off (that large heart would let you open yourself to being taught a few tech things in a jiffy). You also have the gift to connect, to empathise, to spread love– all sterling qualities in a blogger and a host. I would definitely encourage you to think about it. Not in a concrete or scary way, but as a suggestion from a friend who knows how good you are. This indeed is a special community, and I’m happy that my blogging has allowed me to meet folks who understand me, and make me feel secure enough that I can open up about my vulnerabilities. You’re one of the best. The topic of the blogfest was one of several I’d suggested– I wanted something human and universal, something we can all participate in–irrespective of our professions, our worldviews. In a divided world, we need to rediscover the common thread of life and humanity that connects us all. If people haven’t told you you have a large heart, it’s because they didn’t find the right words at the right time. Life has taught me time and again to tell people what I feel about them, when I feel it. If anything, I’ve been tardy in telling you. I’ll get in touch about joining up with Dan and me in a group, over the coming week, and if we do a blogfest again, you’ll definitely be invited to cohost. My pleasure! I love seeing how others approach these themed posts because it widens all our perspectives. Thanks for visiting. A kindred spirit! I honestly don’t know where I’d be without the rejuvenation that our “Mother” provides. Thanks for sharing! Thank you! We are all amazingly similar in many respects. Bloggers are a terrific community. Now these are treasured objects! Nature provides so much beauty and you have created such beauty from it. Thank you, Sue. I appreciate your encouragement! Aah nature! It’s certainly something to cherish. I must say I do too but didn’t think of writing about it. Great post. Thank you for visiting. I’ve enjoyed reading such interesting ‘cherished’ variations during this blogfest. “The brilliant sunshine blesses my endeavor”…beautiful, Mom. Thank you, Elizabeth. I was thinking about you and the Adirondacks on my walk this morning as I was ‘mind-composing’ an upcoming post. I hope you are doing well. more people should slow down and share in the astounding beauty of a nature walk. i enjoyed your cherished post! Thank you, Tara. I appreciate your visit and supportive comments! Channelling Goldilocks – perfect description for my experience, too. So many ways to approach the challenge and only 500 words. Love what you’ve done with the maps! Thank you, Jill 😀 i have enjoyed meeting many more bloggers and each has a unique way of showing what matters to all of us. Very special Blogfest, indeed. Great post! I know about Zentangle (but haven’t been able to get in a class yet at our local paintbar – they’re very booked) but really like how you’ve mashed up the two. I think a lot of us have been weighing objects while knowing that what we truly cherish is less tangible – nice work! Thank you 😀 there are lots of online sites, including many blogs, that show the stepouts for tangles as well as You Tube videos for specific patterns. Don’t let the waiting for a class keep you from jumping in !! Just google ‘zentangles’ and go for it! So — I’m not the only one left who still remembers making hopscotch squares with rocks from the driveway! I did enjoy this. When I bring souvenirs home from trips, there aren’t any shot glasses or plastic coasters. From where I’m sitting at this moment, I can see some rocks from the Sabinal river, a clutch of dogwood stems, a copper basket filled with geodes, fossils, and crystals, and a huge bouquet of little bluestem from Kansas. Believe me, there’s more. I think your projects with your cherished objects are wonderful. I’m not a crafty person at all, but I do have a friend who creates handmade journals with objects d’nature, much as you have your topo maps. I have some I’ve purchased from her, and I hardly can bring myself to write in them. I need to start using them and enjoying them. Maybe I’ll even write in them with a real ink pen. I don’t participate in challenges and blogfests, and generally don’t read posts associated with them, but I really enjoyed this. Your creativity made it worthwhile! Thank you, Linda. You have rapidly become one of my favorite bloggers because your posts shimmer with poetic writing, evocative thoughts and mesmerizing photos. It means a lot to me to receive your praise. It does not surprise me one iota that your souvenirs mirror mine. I have been as enchanted with the nature part of travel as I am with the people and structures, no matter where we go. One suggestion for your artsy journals that you are reluctant to use – this year I finally broke through my self-imposed barrier by recording quotes (including from blog comments); definitions of words I needed to look up; or any other tiny word-related ‘save me’ notations. I was stuck on using them as ‘normal’ journals, but I’ve filled a few since trying these other uses. I have a folder in my computer (replacing the paper one I used to have in my desk) with all sorts of quotes I love that I’ve collected over the years! Hah! Then I started watching a YouTube video only to find out that I zentangle when I talk on the phone!!! LOL. THAT’s too funny !! Lordy, delete that!! I was trying to correct my typos and the comment sent itself!! LOL I managed to figure out what you were trying to “say”! 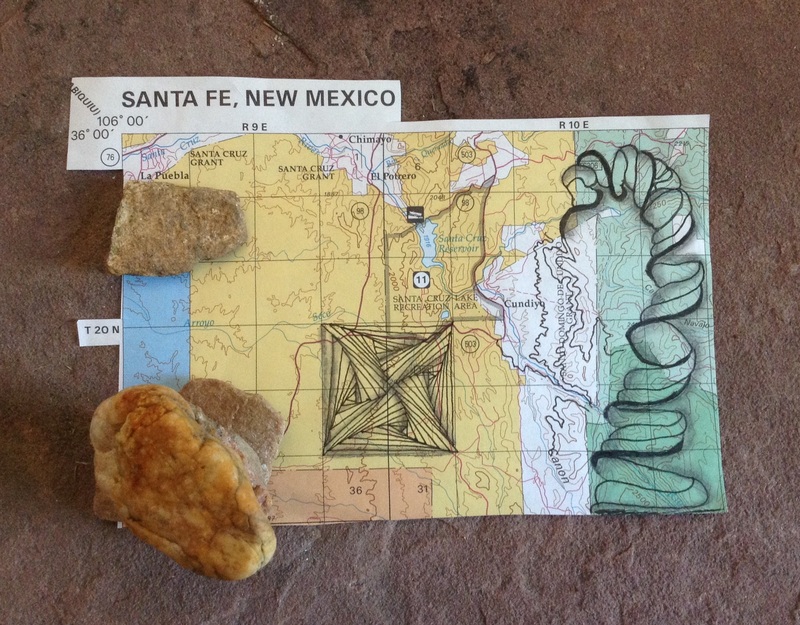 Sammy D. Thank you for the new use for topo maps. if one cannot manage to be lost in the woods then that would be the next best use. Thanks, John. You got a chuckle out of me! Sammy D., how did I miss this post on your Cherished object? I did participate on day one. But didn’t get to go blog-visiting much. I loved your nature objects. And now I know more about your talents. Collecting stones/rocks is my thing, but only to be placed as decorations. I’m not a crafty sort of person. Thanks for putting together such a creative, delightful post. Christine. Thank you, Christine. Lots of things are slipping through my cracks. I’m blaming the weather! I do love my rock collection. Glad you enjoy yours, too!